Recent physiological studies claim that dark stimuli have access to greater neuronal resources than light stimuli in early visual pathway. We used two sets of novel stimuli to examine the functional consequences of this dark dominance in human observers. We show that increment and decrement thresholds are equal when controlled for adaptation and eye movements. However, measurements for salience differences at high contrasts show that darks are detected pronouncedly faster and more accurately than lights when presented against uniform binary noise. In addition, the salience advantage for darks is abolished when the background distribution is adjusted to control for the irradiation illusion. The threshold equality suggests that the highest sensitivities of neurons in the ON and OFF channels are similar, whereas the salience difference is consistent with a population advantage for the OFF system. Mach (1886) demonstrated that the perception of configurations as wholes is disrupted if their components are separated into dark and light contrast polarities. Physiological evidence for independent processing of light increments and decrements by separate ON and OFF pathways in the retina was provided by Hartline (1938). The segregation begins at the first synapse of photoreceptors with sign-inverting and sign-conserving bipolar cells (Werblin and Dowling, 1969) and persists at the striate cortex (Jin et al., 2008). But does the visual system treat these two inputs as equals differing only in polarity? Neuroanatomical and neurophysiological studies in macaques and cats indicate OFF dominance of neural resources: there are more OFF than ON bipolar cells in the central retina (Ahmad et al., 2003), OFF center geniculate afferents dominate the cortical representation of central vision (Jin et al., 2008, 2011), and visual responses to dark stimuli dominate the superficial layers of V1 (Yeh et al., 2009; Xing et al., 2010). In addition, darks generate larger visual evoked potentials than lights (Zemon et al., 1988). Psychophysical threshold measurements of ON and OFF sensitivity have given mixed results (Blackwell, 1946; Krauskopf, 1980; Bowen et al., 1989; Poot et al., 1997). More complex behavioral tasks have revealed the advantage of dark-on-light over light-on-dark in reading (Buchner and Baumgartner, 2007) and the primacy of dark texels in judging texture variance (Chubb and Nam, 2000). We first show that, when adaptation is equated for and eye movements cannot contaminate the measurements, ON and OFF channel sensitivities are essentially equal at threshold. Then we show that, at suprathreshold levels on uniform noise backgrounds, observers can report the number of dark targets significantly faster and more accurately than light targets. Finally, we show that the advantage for darks disappears when the background is adjusted for the irradiation illusion, in which lights in dark backgrounds appear larger than physically equal darks in light backgrounds (Galilei, 1632). All stimuli were presented using MATLAB (Mathworks) and Psychtoolbox 3 (Brainard, 1997) on a Sony GDM-F520 21 inch CRT monitor, calibrated for linearity, subtending 3.84° × 5.12° of visual angle at a distance of 4.2 m, each pixel subtending 0.05° × 0.05°. The mean luminance of the monitor was held constant at 50 cd/m2. Experiments were conducted in a dark room. Observers used a numerical keypad to respond. Seven observers (4 females and 3 males, including an author, S.J.K.) with corrected or 20/20 vision participated in experiment 1, and four observers (1 male and 3 females) participated in experiments 2 and 3. Experiment 1: sensitivity of isolated ON and OFF channels. To selectively activate ON and OFF pathways, observers first adapted for 120 s to the mid-gray of the monitor, then either a horizontal or a vertical square-wave grating appeared as an increment or a decrement on the adapting level, that is, one set of bars remained at mid-gray (Fig. 1A). Observers were required to report the orientation of the grating. After 0.1 s, the grating was turned into a horizontal–vertical grid for 0.05 s, ensuring that the observers' horizontal versus vertical decisions could only use the 0.1 s period, which minimizes the chance of an eye movement activating both channels across spatial edges. Under this condition, the receptive field centers of ON and OFF cells respond to increments and decrements respectively. The receptive field surrounds also respond to the opposite polarity but with a much weaker response than those generated by the receptive field centers. Because psychophysical thresholds are determined by the most responsive neurons, it is reasonable to assume that increments are conveyed mostly by the receptive field centers of ON cells and decrements by the centers of OFF cells. Contrast thresholds were measured using the method of constant stimuli at spatial frequencies of 16, 24, and 32 cycles/degree (cpd), using 50 trials per level. 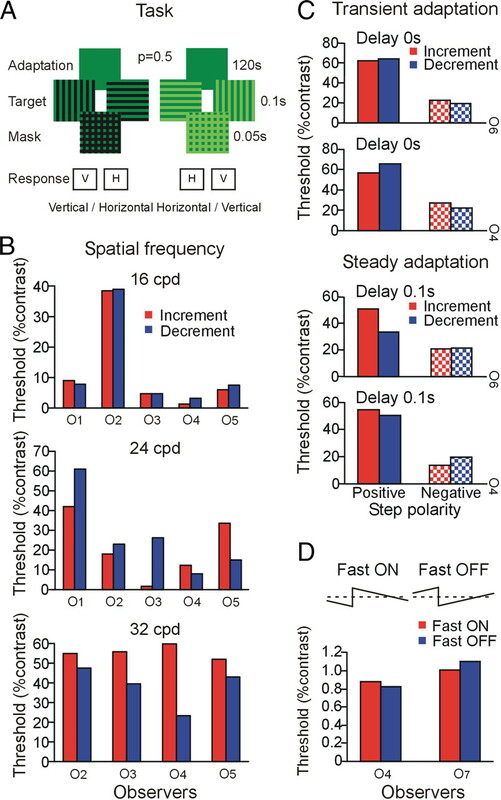 Sensitivity of ON and OFF pathways during different levels of transient and steady adaptation was measured using the same stimulus sequence at 16 cpd but with the background shifted 0.5 or 1.5 times the mid-gray, at 0 s or 0.1 s, before the onset of the grating. As an additional test, we used temporal sawtooth modulation, which has been shown to selectively activate ON and OFF retinal ganglion cells (Kremers et al., 1993), and asked observers to detect the presence of flicker on a 2° circular field against a mid-gray background in a two-interval forced-choice (2IFC) task. Sensitivity of ON and OFF channels. A, Stimulus sequence to isolate ON and OFF channels. Observers (O1–O6) reported the orientation of the grating using two-alternative forced choice [horizontal (H) vs vertical (V)]. B, Contrast threshold for increment and decrement gratings for 16, 24, and 32 cpd. C, Contrast threshold measured for increment and decrement gratings presented 0 s and 0.1 s following positive and negative step changes. D, Contrast threshold for fast ON and fast OFF sawtooth modulation at 8 Hz (observers O4 and O7). Experiment 2: reaction times to dark and light targets. The three parameters of the function, mean (μ) and standard deviation (σ) of the normal component and mean of the exponential (τ), were estimated using maximum likelihood estimation. The goodness of fit was tested using a χ2 statistic. The mean RT for the distributions was calculated as the sum of the Gaussian and exponential means. Post hoc planned contrasts compared the mean RTs of dark and light targets. Reaction time distributions to dark and light targets on uniform binary noise background. A, C, Stimulus sequence of dark and light targets (1 to 3) presented in random order on a noisy background. B, D, RT distributions for correct responses to the number of dark and light targets for observers O6, O8, O9, and O10. Solid lines are exponential Gaussian fits to the data points (triangles). Chubb and Nam (2000) used independent and identically distributed textures composed of nine equally spaced gray levels from light to dark to determine the impact of different gray levels in judging texture variance. They demonstrated that the perception of texture contrast is affected disproportionately by dark texels. To test whether we could replicate their results with our stimuli, we repeated our detection experiment on a background consisting of a uniform distribution of nine equally spaced luminance levels. The targets were uniform noise patterns with luminance values from the top three levels for light and bottom three levels for dark (Fig. 2C). Correct responses for Figure 2C are 2, 2, 3, 1, 2, 1, 1, 3, 2, 3, 2, and 3. Experiment 3: correction for the irradiation illusion. Consistent with the irradiation illusion, the light texels in the uniform binary noise appeared larger than the physically equal dark texels. To test whether the perceptual inequality of the background favored the detection of dark targets, we measured the irradiation illusion with two methods and controlled for it. In method 1, we presented a single dark or light texel from the binary background against a larger background of opposite polarity (Fig. 3A, left). At physical equality, the light square appeared larger than dark. Therefore, using larger versus smaller responses from each observer, the size of the light square was adjusted to achieve perceptual equality with the fixed dark square. The mean size (SEM < 0.001) for each observer was calculated from eight reversal points per session for 10 sessions (SD < 1.5). In method 2, the dark/light proportion was varied randomly through seven different values (Fig. 3A, right), and observers reported whether the binary noise background had more light area or dark. The dark/light proportion at which observers equated for area was estimated from psychometric fits. Targets were then presented on binary backgrounds with binomial probabilities for dark and light texels adjusted to correct the irradiation illusion for each observer. Reaction time distributions to dark and light targets on adjusted background. A, Method 1: size of the light square was adjusted to match the size of dark square based on two-alternative forced-choice observer's response (left). Method 2: observers judged the areas occupied by dark and light texels in binary noise stimuli (right). B, Perceptual adjustments measured with methods 1 and 2 in four observers (O6, O8, O9, and O10). The sizes of dark and light texels were perceived as equal when the ratio Light/(Dark + Light) ≈ 0.4. C, RT distributions illustrated as in Figure 2. To isolate sensitivities of ON and OFF channels, after adaptation to mid-gray, either a horizontal or a vertical square-wave grating appeared as either an increment or a decrement on the adapting luminance (Fig. 1A). To minimize the chances of an eye movement activating both channels, the grating turned into a horizontal–vertical grid to mask the critical orientation information. Figure 1B shows contrast thresholds for five observers to increment and decrement gratings. The results show that there was no significant difference in performance between ON and OFF channels at steady adaptation, except that thresholds at 32 cpd were consistently lower for decrements than increments. However, the difference did not reach significance (Wilcoxon signed-rank test, p = 0.068). Next, we measured the sensitivity of ON and OFF channels during different levels of transient and steady adaptation, using the same stimulus but with the background shifted 0.5 or 1.5 times the mid-gray at 0 s or 0.1 s before the grating presentation. Figure 1C shows that contrast thresholds after negative step changes were significantly lower than for positive step changes (Poot et al., 1997), but there was no consistent threshold difference for increments and decrements in any adaptation condition. We also used sawtooth modulation to selectively activate ON and OFF channels (Kremers et al., 1993). Two observers were asked to detect the presence of flicker on a circular field against a mid-gray background. The flicker detection thresholds (Fig. 1D) show no consistent difference between fast ON and fast OFF sawteeth at 8 Hz, contradicting results using the method of adjustment (Bowen et al., 1989), but consistent with ganglion cell measurements showing equal ON and OFF cell sensitivity (Kremers et al., 1993). Four observers were asked to report, as rapidly as possible, the number (1 to 3) of dark or light target squares against a uniform binary noise background randomized for every trial (Fig. 2A). The RT distributions in Figure 2B show that, on average, observers responded 0.2 s faster to dark targets than light targets (p < 0.01, ANOVA) and were also more accurate at reporting the number of dark targets (92% vs 83% correct). We repeated our detection experiment on a uniform distribution of nine equally spaced luminance levels (Chubb and Nam, 2000). The targets were uniform noise patterns with luminance values from the top three levels for light and bottom three levels for dark (Fig. 2C). In the results shown in Figure 2D, the RTs and percentage correct on the nine level backgrounds were also better for dark than light targets. In trying to identify the causes of this dark/light asymmetry, we observed that the background binary noise appeared to have more area covered by light than dark despite physical equality, seemingly consistent with the irradiation illusion (Galilei, 1632). The magnitude of the illusion was estimated with two methods. First, we presented a single dark or light texel from the binary background against a larger background of opposite polarity (Fig. 3A, left) and asked observers to adjust the size of the light square to achieve perceptual equality with the fixed dark square. Second, the observers reported whether the binary noise background had more light or dark area while the dark/light proportion was varied randomly through seven different values (Fig. 3A, right). The two methods used to measure the irradiation illusion converged to approximately the same value: Light/(Light + Dark) = 0.4 (Fig. 3B). When the backgrounds were corrected for the irradiation illusion so that the background looked equally dark and light, the RT and percentage of correct responses for dark and light targets were similar (85% vs 87% correct) (Fig. 3C). These results suggest that the dark/light asymmetry was caused by the perceptual inequality in the uniform background. Our results demonstrate that contrast thresholds for increments and decrements are similar across different spatial frequencies (Fig. 1B,C). However, at suprathreshold levels in noisy backgrounds, we show that darks are perceived remarkably faster and more accurately than lights. Moreover, we show that the advantage to perceive darks disappears when the background is adjusted to correct for the irradiation illusion. The perceptual advantage for darks with a simple detection task is consistent with recent studies showing a dominant representation of dark stimuli in early visual processing (Ahmad et al., 2003; Jin et al., 2008, 2011; Yeh et al., 2009; Xing et al., 2010). Our threshold results contradict previous psychophysical claims that observers are more sensitive to decrements than increments at threshold (Blackwell, 1946; Krauskopf, 1980). The short presentations of incremental and decremental gratings in our study (Fig. 1A) were designed not only to isolate ON and OFF pathways by minimizing eye movements, but also to minimize adaptation changes caused by the test stimulus. Because light adaptation is faster after a negative step change than after a positive step (Poot et al., 1997), longer stimulus presentations would lead to lower measured thresholds for decrements. The equal thresholds for rapid OFF and rapid ON sawtooth modulation obtained with our objective 2IFC method (Fig. 1D) also contradict the differences reported using the less accurate method of adjustment (Bowen et al., 1989). 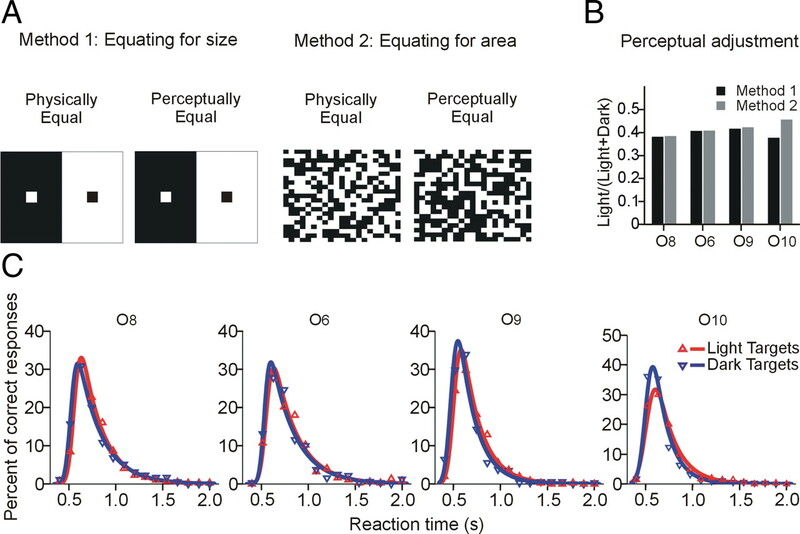 Psychophysical thresholds reflect the responses of neurons most sensitive to the test stimulus, so taken together, our threshold results suggest that the highest sensitivities of neurons in the ON and OFF channels are similar. Recordings from retinal ganglion cells confirm our results that sawtooth modulation can be used to isolate ON and OFF visual responses, and that the two classes of cells have similar sensitivity under photopic conditions in macaques (Kremers et al., 1993). Our main result is that dark targets are perceived faster and more accurately than light targets at suprathreshold levels in noisy backgrounds (Fig. 2). Because these results cannot be due to differences in the peak sensitivities of ON and OFF pathways, a possible explanation could be based on the greater neuronal resources to process darks available in the early visual pathway (Ahmad et al., 2003; Jin et al., 2008; Yeh et al., 2009; Xing et al., 2010). An alternative explanation could be based on asymmetries in the response variability to darks and lights. The information-theoretic analysis of Pandarinath et al. (2010) shows that, in a Poisson distribution, decrements from the mean are more discriminable than increments because they have lower variability. Their derivations predict that the integration periods required for detection should be smaller for decrements than for increments. We have considered different ways in which Poisson photon statistics could apply to the detection of dark and light patches in experiment 2. On the uniform binary noise, 50% of each test patch was a transition from the opposite polarity (see Materials and Methods). For these binary stimuli, the Pandarinath et al. (2010) equations predict decrements to be 0.96 times as discriminable as increments, which is much smaller in magnitude and in the wrong direction from the results of experiment 2. Further, the binary noise backgrounds are not treated by the “salience” system as equivalent mean level backgrounds because, if the noise backgrounds in experiment 2 are replaced by uniform backgrounds equated for mean luminance, there is no RT difference between detection of dark and light patches. Finally, if the patches are detected by eye movements across their boundaries, there will be equal numbers of transitions of each polarity for each eye movement on backgrounds with equal numbers of light and dark texels. Consequently, our stimulus design excludes photon decrement/increment asymmetries as an explanation. Further, both dark and light targets predominantly evoke incremental response in OFF and ON cells, respectively, so a difference between incremental and decremental Poisson spike trains does not apply to the tasks in experiments 2 and 3. In the irradiation illusion, a light square on a dark background appears larger than a dark square on a light background, and this makes uniform binary noise seem to have greater light area. It is interesting that correcting for the illusion abolishes the salience advantage for darks (Fig. 3C). The locus of the irradiation illusion remains elusive, but it is often suggested that it is due to light scatter originating in the optical structures of the eye. Our results suggest that the locus of the irradiation illusion is earlier than the locus of the saliency task in experiments 2 and 3, but do not identify the anatomical location of the illusion. Mathematically, blurring plus a nonlinear compression of the luminance signal simulate the irradiation illusion. The main question is whether the nonlinearity is early and affects all visual tasks, or whether it is late so that it only affects the most complex tasks. To test for an early locus, we took as the input a pair of dark and light squares against a larger background of opposite polarity (Fig. 3A) and used a simple model comprising three sequential stages. At each stage, we compared the full width at half-height of the maxima (FWHM) of the dark to the light output waveform: (R = FWHM(Dark)/(FWHM(Light) + FWHM(Dark))). The inputs were first convolved with the point-spread function of the eye (Campbell and Gubisch, 1966) for the pupil size appropriate to the mean luminance (Le Grand, 1957). Convolution with the point-spread function decreased the contrast of the texels without altering their FWHM ratio. The output was then passed through a compressive nonlinear function of the form 0.5 × log (1 + 2Ω). The compressive function changed the FWHMs to a ratio R = 0.43. Finally, ON and OFF difference of Gaussian filters (Rodieck, 1965; Chichilnisky and Kalmar, 2002) were applied separately to the dark and light texels from the preceding stage. Filtering added an extra distortion, so that the model gave an irradiation illusion similar to that obtained empirically (R = 0.4). These simulations indicate that published measures of optical blur are not sufficient to account for the magnitude of the irradiation illusion unless a compressive nonlinear function of luminance is added in the early stages of visual processing. Even though there is evidence for compressive response functions as early as photoreceptors (Schnapf et al., 1990), we were unable to find definitive measurements of the nonlinear function to use in our model. We can only conclude that, if the retinal nonlinearity is not sufficient to explain the irradiation illusion, some or part of the illusion could be due to cortical mechanisms. Consistent with a later locus for the irradiation illusion are the gain-control mechanisms in the retina (Shapley and Victor, 1978; Kaplan and Shapley, 1986; Smirnakis et al., 1997; Brown and Masland, 2001) that lead to fairly linear contrast-response curves for parvocells in the LGN. In addition, the result of Nam and Chubb (2000) demonstrated that gray levels carry weight proportional to their values when observers judge average luminance of random textures, a finding that is incompatible with an early nonlinear compression of luminance. Perhaps the differences between ON and OFF pathways contribute to this classical illusion. For example, ON retinal ganglion cells in the retinal periphery have larger receptive fields than OFF retinal ganglion cells (Chichilnisky and Kalmar, 2002), and the OFF pathway is better represented than the ON pathway at the center of vision in the cortex (Jin et al., 2008, 2011). The irradiation illusion could explain results of complex behavioral tasks showing suprathreshold ON/OFF asymmetries. For example, Chubb and Nam (2000) demonstrated that dark texels carry more weight when judging luminance variance of random textures, and the results in Figure 2, C and D, show that the nine-level Chubb–Nam noise backgrounds have a similar effect on dark salience as the uniform noise background. Therefore, the irradiation illusion that can account for the measured salience differences in our stimuli could also explain the dominance of dark texels when perceiving texture variance. Another manifestation of the irradiation illusion is that light letters on dark appear less sharp than dark letters on light, and this could potentially explain the differences in reading performance (Buchner and Baumgartner, 2007). It is worth noting that the luminance profile of natural scenes has been shown to be skewed toward darks (van Hateren et al., 2002; Balasubramanian and Sterling, 2009; Ratliff et al., 2010). Although the presence of smaller, denser, and more numerous OFF bipolar cells suggests an evolutionary adaptation to these luminance statistics, our results offer a related functional interpretation. The greater amount of dark makes natural scenes similar to our irradiation-corrected backgrounds. Hence, analogous to the results of experiment 3, the asymmetry in natural luminance statistics will serve to equalize the salience of darks and lights in natural scenes. We are grateful to NIH (EY013312, EY007556, and EY005253) for funding support and to the observers who participated in the study. (2003) Cell density ratios in a foveal patch in macaque retina. Vis Neurosci 20:189–209. (2009) Receptive fields and functional architecture in the retina. J Physiol 587:2753–2767. (1946) Contrast thresholds of the human eye. J Opt Soc Am 36:624–643. (1989) Sawtooth contrast sensitivity: decrements have the edge. Vision Res 29:1501–1509. (2001) Spatial scale and cellular substrate of contrast adaptation by retinal ganglion cells. Nat Neurosci 4:44–51. (2007) Text-background polarity affects performance irrespective of ambient illumination and colour contrast. Ergonomics 50:1036–1063. (2002) Functional asymmetries in ON and OFF ganglion cells of primate retina. J Neurosci 22:2737–2747. (2000) Variance of high contrast textures is sensed using negative half-wave rectification. Vision Res 40:1677–1694. (2008) How to use MATLAB to fit the ex-Gaussian and other probability functions to a distribution of response times. Tutorials Quant Meth Psych 4:35–45. (1632) in Reprint, Dialogue concerning the two chief world systems, trans Drake S (University of California Press, Berkeley) 1967, Rev Ed 2. (1938) The response of single optic nerve fibers of the vertebrate eye to illumination of the retina. Am J Physiol 121:400–415. (2011) Population receptive fields of ON and OFF thalamic inputs to an orientation column in visual cortex. Nat Neurosci 14:232–238. (2008) On and off domains of geniculate afferents in cat primary visual cortex. Nat Neurosci 11:88–94. (1986) The primate retina contains two types of ganglion cells, with high and low contrast sensitivity. Proc Natl Acad Sci U S A 83:2755–2757. (1980) Discrimination and detection of changes in luminance. Vision Res 20:671–677. (1993) Responses of macaque ganglion cells and human observers to compound periodic waveforms. Vision Res 33:1997–2011. (1957) Light, color and vision (Wiley, New York). (1886) Beiträge zur Analyse der Empfindungen (Verlag von Gustav Fischer, Jena, Germany). (2000) Texture luminance judgments are approximately veridical. Vision Res 40:1695–1709. (2010) Symmetry breakdown in the ON and OFF pathways of the retina at night: functional implications. J Neurosci 30:10006–10014. (1997) Dynamics of adaptation at high luminances: adaptation is faster after luminance decrements than after luminance increments. J Opt Soc Am A Opt Image Sci Vis 14:2499–2508. (1979) Group reaction time distributions and an analysis of distribution statistics. Psychol Bull 86:446–461. (2010) Retina is structured to process an excess of darkness in natural scenes. Proc Natl Acad Sci U S A 107:17368–17373. (1965) Quantitative analysis of cat retinal ganglion cell response to visual stimuli. Vision Res 5:583–601. (1990) Visual transduction in cones of the monkey Macaca fascicularis. J Physiol 427:681–713. (1978) The effect of contrast on the transfer properties of cat retinal ganglion cells. J Physiol 285:275–298. (1997) Adaptation of retinal processing to image contrast and spatial scale. Nature 386:69–73. (2002) Processing of natural temporal stimuli by macaque retinal ganglion cells. J Neurosci 22:9945–9960. (1969) Organization of the retina of the mudpuppy, Necturus maculosus. II. Intracellular recording. J Neurophysiol 32:339–355. (2010) Generation of black-dominant responses in V1 cortex. J Neurosci 30:13504–13512. (2009) “Black” responses dominate macaque primary visual cortex V1. J Neurosci 29:11753–11760. (1988) Asymmetries in ON and OFF visual pathways of humans revealed using contrast-evoked cortical potentials. Vis Neurosci 1:145–150.